Learning the rules of play is very important to all roulette players.Study existing systems and find out which systems work and which don’t. This article offers good roulette tips which have been studied carefully, tested repeatedly, and proven time and again. 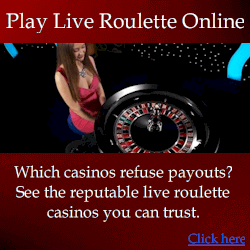 Don’t waste your time and money playing roulette in online casinos. They’re impossible to beat because they use software roulette, not the real wheel. It’s more popularly known as RNG (or random number generator) roulette and the winner is determined by a computer. It’s a slot machine complete with computer graphics to simulate a real roulette wheel. Although roulette has several betting options, there are two main types – inside and outside bets. A player must master these bets, and totally understand how the concept of bet type works with the payout system and the concept of probability. A bet on a single-number has a 1/37 chance or probability of winning. If the number wins, this bet is paid 35 chips plus the original bet, the highest payout in the system. Bets on large groups of numbers, such as dozens, blacks/reds, columns and odds/evens, have a higher chance of winning, but will have lower payouts. The European roulette wheel should be your choice if the casino offers both this and the American versions. The main difference is in the extra slot for double zero in the American wheel. This is very significant because it decreases the chance of every bet you make on a number. To illustrate, a bet on a straight made in the European wheel has a 1/37 (2.7%) chance of making a spin. The same bet made in the American wheel has a reduced chance of 1/38 (2.63%) because of the extra pocket. That’s another way of saying that the odds are against you winning a spin (36/37 and 37/38). With the same payout systems used for both roulette versions, the house has a bigger advantage with the American roulette wheel. Defects on manufacturing or design in roulette wheels can cause wheel bias. A pocket that is very slightly bigger than the others will cause a considerable bias. This minute imperfection can cause the wheel to spin certain numbers more often than others, and a discerning player can make this predictability work to his or her advantage. 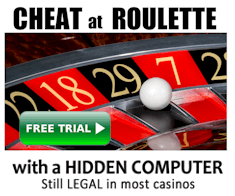 While many methods are being touted to effectively beat roulette, this method is a very discreet method for sustaining your winning advantage. Most professional players actually use this concept of wheel physics to consistently spin a win in the game of roulette. The fact that casinos spend thousands on software to analyze wheels and detect biases is proof enough that these biases can cause significant losses on the casinos’ part. The house edge is something that roulette players have to overcome. By using an electronic device that measures ball and rotor speeds to predict the winning number, a player can very well pull off a significant advantage over the casino. Since these computer devices only predict game results without directly interfering into the play, they are deemed legal in most casinos.While this is true, it pays to maintain low profile because the casino has many methods at its disposal to prevent you from winning continuously. Casinos know that dealers or croupiers can develop a signature in the way they spin the wheel and throw the ball. This makes some spins predictable. This is also the reason why their assignments are regularly changed or rotated. Study the dealer’s signature, analyze if this signature affects the ball’s bounce and distance covered before finally settling. Make neighbor bets in accordance to your observation of likely physical areas landed on by the ball. Martingale – this involves doubling the previous bet size after a loss, with the hope of recovering money lost in the previous rounds. Increasing your bet size will only increase the amount of risk you place on a particular spin, and further deplete your bankroll. Labouchere –this is still a betting progression system similar to Martingale, which guarantees nothing but the speedier depletion of your bankroll. Thinking that something is due to come out – after a series of blacks, some gamblers believe that a red is due next. Others also think of this as a streak of black, and another black is in the offing. Nothing could be farther from the truth, of course. The probability of either a black or red is actually the same for both colors. The key to success in the roulette table depends so much on what’s physically happening between the wheel and the ball, and not so much on betting strategies. Those are the basic factors that determine which number or slot the ball will settle on. All roulette success stories and all good roulette tips involve a form of wheel physics. If there is a sure way to beat roulette, it is with physics.